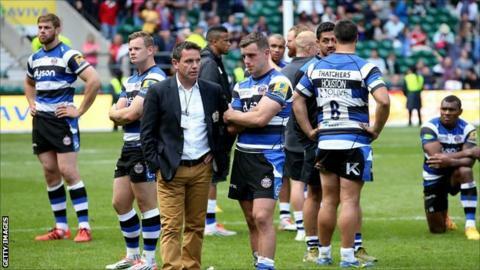 Bath Rugby managing director Tarquin McDonald says the club are ready to win a trophy after their Premiership final disappointment. Bath were beaten by Saracens in Saturday's final at Twickenham. However, McDonald says their success this season has strengthened his belief they are close to ending a 19-year wait for an English rugby title. "We absolutely want to win titles, clearly it's been longer than any of us would have liked," said McDonald. "We think we are good enough and I don't think that weight of expectation is a burden on us. If anything it inspires us to be able to start thinking about the future." Their appearance in Saturday's final was their first since 2004 and in an interview with BBC Points West, McDonald said he is convinced the squad can improve on this season. "Next season we will be challenging," he added. "I think the squad we've got and the investment in additional players means we're in good stead to compete in both those competitions and that's what we want to do. We feel we are ready to win a trophy and bring a trophy back to Bath. Bath's long wait goes on..
Bath have not won a trophy since lifting the European Challenge Cup in 2008. They won the Heineken Cup in 1998 but have not won the domestic league title since 1996, which was their sixth in eight years. "We are all disappointed because we think we are good enough to win, our supporters want to see us win and it has been a long time since we have won a title. "Let's not take away from a fantastic season and everything we have put in place for next season. It's a young team. We will be back stronger next season and we have a really good platform for the seasons ahead." McDonald also says there will be some investment in the squad over the summer. "We've got some key positions to strengthen," he said. "The nine and 10 positions. "Many of the squad are young and they are starting to play together for the club but also for the country which is fantastic experience and the World Cup is going to be phenomenal for the guys. "So it's both adding to the talent we've got as well as building on the brilliant foundation - as well as some of the guys coming through the academy, so the omens are good."